November 11 (Sydney Morning Herald) Rio Tinto chief executive Sam Walsh has speculated that a change of Prime Minister in Mongolia could help progress the company's stalled expansion of the Oyu Tolgoi copper and gold project. But one of his top executives on the project has indicated that the most likely result will be a delay. The giant second stage of the mine has been delayed for several years on the back of multiple disputes between Rio and the Mongolian Government, which owns 34 per cent of the project. The relationship is undergoing a major refresh at the moment after Mongolian Prime Minister Norovan Altankhuyag stepped down last week, only to be followed by the chief executive and chair of Rio's subsidiary in Mongolia; Turquoise Hill Resources. Speaking in China last night, Mr Walsh told Bloomberg television that a change of leadership in Mongolia could be a positive. "I'm hoping it will be a positive sign," he said. "Certainly there are a lot of things that are indicating that people want the project to proceed." But outgoing Turquoise Hill chief executive Kay Priestley said this morning that the change in leadership, which some believe could remain unresolved until December, would likely impact the desired schedule for finalising those disputes. "Last week's resignation of the Mongolian Prime Minister, an announcement that a new cabinet would be formed will likely impact the timing of those discussions," she said. But Ms Priestley would not comment on the likely successor, nor their general stance toward the Oyu Tolgoi project. "We are not in a position to make any predictions or comment on the political environment," she said. "We stand ready and willing to work with the new leadership when in place and continue our engagement." The response earned a rebuke from some Turquoise Hill shareholders who said they were unhappy with the level of guidance over the issue. Rio and Turquoise Hill made an offer to the Mongolian government to resolve all issues in October, but there has been no significant breakthrough in talks since then. The delay has meant that a debt package worth just over $US4 billion from international banks has missed two deadlines. Ms Priestley said many of those banks remained keen to help fund the project, but since the deadline was exceeded for the second time on September 30, further talks would be required to guarantee a renewed financing package. The European Bank for Reconstruction and Development has confirmed to Fairfax Media that its funding commitment did not expire on September 30, and is in fact valid until December 31. The Australian Export Finance and Insurance Corporation is also believed to have a funding commitment for Oyu Tolgoi that lasts until the end of 2014. Ms Priestley warned investors not to become too focused on the Mongolian government issues, saying they already had an operating copper mine that was improving its output, despite more rake arm failures in the September quarter. "Concentrate sales in the third quarter were the best we've seen thus far. With so much discussion focused on the government negotiations I think it is important that we recognise that we have an operating copper and gold mine generating significant operating cash flow," she said. November 12 (Business Insider) Deutsche Bank is confident the dispute between Rio Tinto and the Mongolian government over the company's $US4.9 billion Oyu Tolgoi copper and gold project could be resolved as early as next quarter. The massive expansion plan for the mine has been delayed for several years by a number of disputes between Rio Tinto and the Mongolian government which has a 34% stake in the operation. On Tuesday Rio CEO Sam Walsh said a change of prime minister in the country, after Norovan Altankhuyag stepped down last week, could push the project along. Walsh told Bloomberg television, "I'm hoping it will be a positive sign." In a research note today Deutsche Bank also said it was confident stage two would get going again in coming months. "While the political delays have been disappointing, the time has been spent upgrading the underground mine plan including the addition of a decline which will increase the potential mine output and increase the project options," the bank said. It adds: "Meetings with a number of government representatives also lead us to believe that the dispute resolution could occur within in the next quarter and lead to additional value for all stake holders." Deutsche analysts recently visited the operation and said they left with a view that, "there is an end in sight for the complex politics in the region and then ongoing value accretion for all stakeholders." Located between Russia and China, Mongolia with its young democracy, is protective of its resources and doesn't want to see the value attached to them controlled by foreign entities. It's this sovereign risk Rio has been having to contend with. However, Deutsche said after a period of political instability in Mongolia, during which it was unlikely any decision over a tax dispute would be agreed upon, "The eventual appointment of a new PM could well be a catalyst for resolution". The tax dispute began in February 2013 when the government flagged a $US130 million tax bill which has since been reduced to about $US30 million. Rio is also making changes to the existing operation to cut $200 million from its costs to around $US1 billion, a move Deutsche said it believes seems achievable. With the delays, first ore is now expected to be delivered from Oyu Tolgoi's underground operation in 2019 however the government still needs to sign off on the mine's feasibility study before mining can be restarted. "While it is disappointing that the underground development is still not progressing, the time spent in negotiation with Government has been put to good use with a number of changes made to the site development plan," Deutsche said. "We think all approvals will be received by the end of 1Q15." The bank has also increased its valuation of Rio's 33.5% stake in the project from $US5.8 billion to $US6.8 billion. The bank's total valuation of $US11.9 billion remains well above the independent valuation of $US7.4 billion. Deutsche's increased valuation was the result of its assumption the mine will expand from 100,000 tonnes to 200,000 tonnes per day, its long run copper price is higher at $US3.22/lb than listed Canadian company Turquoise Hill's forecast of $US3.08/lb, and that the inclusion of a second lift and lower capex will boost revenues and productivity. Rio holds a 51% stake in Turquoise Hill for a 34% interest in the Oyu Tolgoi project. The bank expects Oyu Tolgoi to make up between $US1 billion to $US1.2 billion a year or between 5-7% of Rio's earnings over the next decade. Mogi: this is one crazy lady, and dangerous, watch out for this one. This is a veeeeery poor summary of what she said. Ulaanbaatar, November 11 (MONTSAME) A member of parliament Ms G.Uyanga presented on November 11 results of recent studies on Oyu Tolgoi LLC staff salaries and conclusions of the inspection of Oyu Tolgoi project's investment expenditure. The inspection was made by a working group that was set up at order of Deputy PM and Ministers of Mining and of Finance last year, she noted and reminded the media that she asked the cabinet this October 13 to sound an outcome of its discussion of reports by the above working group, to explain why the expenditure report has been include in a list of secret matters, and why 2,724 million USD, reflected in the Shareholders' Agreement, has increased to 5.1 billion. "The inquiry should have been responded within two weeks, but I have not received any answers, the Minister Ch.Saikhanbileg has postponed the response until this November 18," she said. Since the commencement of OT project, some USD 214.4 million (MNT 400 billion and 928 million) went for business trips of Rio Tinto and Ivanhoe Mines groups, apartment rents of foreign personnel of the project, their health services, their gifts to others and donations, she informed. "Petrovis LLC has been supplying expensive fuel to OT project in a monopolist manner since 2007, and receives 20-50 million Togrog every month for so-called salaries of personnel and their insurances," she went on. Thirty four percent of all of the above costs are paid by the Mongolian taxpayers with high interests, she stressed. Petrovis LLC should be investigated by Corruption Combating Agency and other related monitoring organizations, she underlined. November 11 (news.mn) T. Batmagnai, Commissioner of the General Department of Taxation, spoke on current, timely issues. -As the year comes to an end, how will the General Department of Taxation collect tax payments? -Currently taxable income planning is at 74.7 percent at the General Department of Taxation. In past years, the taxation office has increased budget revenue from tax income. Tax income that goes towards that budget was higher in 2013 than in 2012, and in 2014, a higher number is planned than was collected in 2013. In 2014, the General Department of Taxation aims to provide revenue to the budget no less than it did in 2013. The department produced 1.9 trillion MNT for the government budget in 2013, more than it did in 2012. For 2014 the department is in charge of producing 2.6 trillion MNT in revenue from tax income. Everyone knows about the current economic situation, and there is no positive sign from the overseas market. In October, the department applied 1.6 trillion MNT in revenue to the budget, and the tax office will do so according to the law in the last two months of the year. -There are a lot complaints from businesses and entrepreneurs about tax pressure due to the economic downturn. Are there tax burdens or fines due to the economic situation? -There is no tax increase caused by the economic situation. We work here to collect tax payers' reported taxes. There is no means of collecting tax illegally or collecting more. But tax payment delays or laziness for tax payment have been popular lately. Especially when corporations take out a large amount of loans and hesitate in paying their taxes, pretending it is in the name of their projects. Besides, companies have a lot of debt. Most of the companies blame their delayed tax payments on debt payment deadlines. Tax payments among miners are bad. -Some people may say that the General Department of Taxation cut 100 million MNT in taxes for Oyu Tolgoi LLC. What do you say about this? -People in charge of the issue are working on it. So I do not have to give details on the issue. Ulaanbaatar, November 11 (MONTSAME) At the Stock Exchange trades on Tuesday, a total of 36,882 shares of 11 JSCs were traded costing MNT 237 million 793 thousand and 700.00. "Khongon Beton" /23,306 units/, "Khokh Gan" /9,000 units/, "Hermes Center" /2,000 units/, "APU" /100 units/ and "Remicon" /50 units/ were the most actively traded in terms of trading volume, in terms of trading value were "Khongon Beton" (MNT four million 661 thousand and 200), "Khokh Gan" (MNT 945 thousand), "Ulaanbaatar Khivs" (MNT 496 thousand), "APU" (MNT 375 thousand) and "Hermes Center" (MNT two thousand). The total market capitalization was set at MNT one trillion 535 billion 547 million 793 thousand and 411. The Index of Top-20 JSCs was 15,366.12, increasing 20.11 units or 0.13% against the previous day. November 11 (MSE) Buy order of one year Government retail bonds with 16.25% annual interest started from 6 November 2014 and ending today. By the way, total of MNT4.5 billion 12 weeks or 3 months Government bonds with 15.79% annual interest traded between 29 October 2014 and 4 November 2014. Click here to see detailed Government bonds. Ulaanbaatar, November 11 /MONTSAME/ On the foreign exchange auction held on November 11th, 2014 the Bank of Mongolia (BoM) has received bid offer of USD and CNY from local commercial banks. The BoM did not accept any offer. The BoM received MNT Swap agreement bid offers in equivalent to USD 10.0 million, and USD 140.0 million, from local commercial banks and the BoM accepted all offer. Nov. 11 (Bloomberg) -- Mongolia had a $131.4m trade surplus in the first 10 mos. of 2014, compared to a $1.9b deficit in same period in 2013, National Statistical Office says today in a statement on website. Nov. 11 (Bloomberg) -- China bought 88% of Mongolia's $4.6b in exports in the first ten months of 2014, according to data released today by the Mongolian National Statistical Office. November 11 (NSO) The number of unemployed reached 34.2 thousand at the end of October 2014, has shown a decrease of 5.2 thous.persons or 13.3 percent compared with the same period of the previous year. In the first 10 months of 2014, the revenue of the Social Insurance Fund amounted to 1119.6 bln.tog, reflecting increase of 122.6 bln.tog or 12.3 percent and the expenditure of the fund reached 1064.7 bln.tog, increased by 192.5 bln.tog or 22.1 percent compared with same period of the previous year. 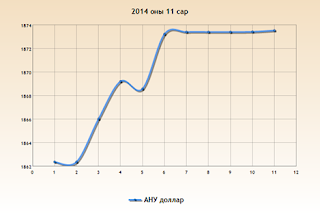 In the first 10 months of 2014, total 116.9 bln. tog granted to 198.8 thous.persons for long-term pensions and welfare benefits from the Social Welfare Fund. Compared with the same period of the previous year, a number of persons received long-term pensions and welfare allowances increased by 2.6 thous.persons or 1.3 percent, and an amount of pensions and allowances increased by 7.1 bln.tog or 6.5 percent as well. 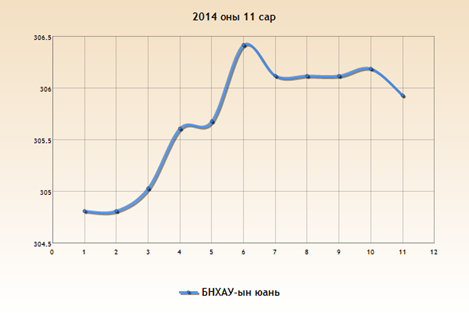 In the first 10 months of 2014, 198.0 bln. tog granted from the Human Development Fund to 987.2 thousand children aged below 18 as a cash benefit. For the acceptable level of air quality standards as of October, 2014, daily average concentration of nitrogen dioxide exceeded 31 times around the West crossroad, 23 times around the 13th micro district, 22 times around the 32nd Toirog, 4 times around the Offitseruudiin ordon, More over the daily average concentration of sulphur dioxide has exceeded 8 times in the area of the 13th micro district, 5 times around the West crossroad the particulate matter less than 10 micrograms exceeded 30 times around the 32nd Toirog, 29 times around the West crossroad, 21 times around the 13 micro district, 16 times around the Kharkhorin market, 4 times around the the Misheel expo particulate matter less than 2.5 micrograms exceeded 22 times around the West crossroad, 8 times around the 13th micro district from the maximum allowable concentration of air quality standard in October 2014. GDP by production approach reached 16517.3 bln.tog at current price and 11093.5 bln. tog at 2010 constant price in the first 9 months of 2014, up 18.8 percent at current price and 7.0 percent at constant price compared with the same period of the previous year. GDP by expenditure approach reached 15847.3 bln.tog at current price, 11150.3 bln. tog at 2010 constant price in the first 9 months of 2014, up 16.7 percent at current price and 7.3 percent at constant price compared with the same period of the previous year. According to report of the Bank of Mongolia, money supply (broad money or M2) reached to 10.0 trill.tog at the end of October 2014, went down by 90.2 bln.tog or 0.9 percent from the previous month, while it goes up by 1.3 trill.tog or 14.5 percent compared with same period of the previous year. At the end of October 2014, currency issued in circulation reached 809.6 bln.tog, went down by 17.6 bln.tog or 2.1 percent from the previous month while went down by 15.1 bln.tog or 1.8 percent from same period of the previous year. Loans outstanding 2014 amounted to 12.8 trill.tog at the end of October, increased by 222.0 bln.tog or 1.8 percent from previous month and 2.3 trill.tog or 22.4 percent from the same period of the previous year. Principals in arrears reached 450.6 bln.tog at the end of October 2014, goes down by 14.0 bln.tog or 3.0 percent from previous month, while it went up by 281.1 bln.tog or 2.7 times compared with same period of the previous year. At the end of October 2014, the non-performing loans over the bank system reached 606.3 bln.tog, goes up by 15.9 bln.tog or 2.7 percent from the previous month while it goes up by 45.8 bln.tog or 8.2 percent from same period of the previous year. 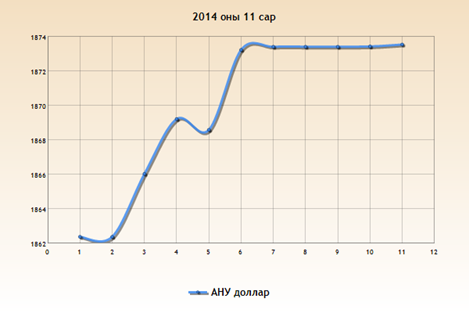 In the first 10 months of 2014, 41.7 mln. shares were traded valued at 139.0 bln.tog in the stock market. The securities trading was decreased by 107.7 bln.tog or 43.7 percent and shares decreased by 17.9 mln.shares or 30.0 percent compared to same period of the previous year. Australian mining analysts are surprisingly optimistic about the outlook for resources. November 10 (The Diplomat) The resources boom may have faded, but the "super cycle" is far from over. That was the message from the Mining 2014 conference in Brisbane, Australia, with analysts forecasting an upturn even as key commodity prices continue to slide. On Thursday, the price of iron ore dropped to a five-year low of $75.38 per ton in China, continuing a retreat that has seen the key steelmaking ingredient lose nearly half its value this year on a continued supply glut and weaker demand from China. According to Morgan Stanley, oversupply will drive the price of spot iron ore to $70 a ton by year-end, with the world's biggest miners continuing to expand output. Thermal coal prices have also slumped to five-year lows around $73 a ton, compared to the $120 reached in mid-2011, with sentiment hit by new Chinese coal tariffs along with a U.N. report calling for an end to coal-fired power. Gold prices have dived to four-year lows around $1,137 an ounce amid a rising U.S. dollar, which hasreduced demand for the precious metal as a hedge against inflation, while oil prices have slipped into bear market territory on increased U.S. production and reduced demand. Despite the gloom, analysts including Westpac senior economist Justin Smirk told the October 29-30 conference that an upturn was still in sight, despite recent economic and geopolitical "shocks" including Ukraine, Japan's consumption tax hike, China's slowdown and the Ebola scare. "2014 has turned out to be surprisingly weak – we thought the world economy would recover better but it hasn't…but we're still seeing a better outlook for '15 and '16," Smirk said. "Chinese growth will be looking better next year; Japan's speed bump is over; Europe is looking better and anxiety will be lower around the world," he added. "We are currently about six years out of the global financial crisis, and most economies usually take around seven years to recover. That's why we think '15 and '16 are looking like better growth years." According to Smirk, the resources 'super cycle' "is not over but "it has matured and will continue to do so…supply dynamics are shifting and now focusing on minimizing costs rather than lifting production at any cost. "Just now is 3 am in the morning for the commodity cycle. 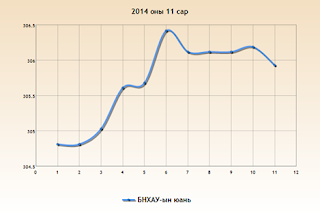 Just how much prices can rise in 2015 will depend not just on the supply outlook but also the demand cycle. While not all commodities are equal, 2015 should be a better year with 2016 in line to be a vintage one." Westpac expects Chinese gross domestic product (GDP) growth to slip to 7.4 percent this year due to a weaker manufacturing and housing sector. However, the Australian bank sees the world's second-biggest economy expanding to 7.5 percent GDP growth in 2015 and 7.6 percent the following year, assuming it remains in its "development cycle" phase. "[China's] fiscal policy plus exports must share the burden till there is a lift in the domestic economy…Housing activity will gradually improve, but not consistently until next year," he said, although he noted the effects of a corruption crackdown on consumption. The bank expects the United States to be a key driver of world growth, rising from 2 percent GDP growth in 2014 to 3.2 percent by 2016, while the Eurozone is expected to stabilize at 1 percent growth in 2015 and 2016. Japan's GDP is forecast rising from 1 percent this year to 1.6 percent growth by 2016, while India is expected to post a rapid pickup, from a 5.5 percent expansion in 2014 to 7.7 percent by 2016 thanks to the "Modi effect" and low developed world interest rates. However, Smirk warned that the rebound could fade by 2017/18 as the effects of higher interest rates hit world growth. "The second half of 2017, first half of '18 is one to watch, based on interest rates and policies," he said. "And if China actually goes into a [normal] business cycle rather than a development cycle, watch out. The mining sector's volatility has hit junior exploration companies hard, but Breakaway Research senior resource analyst Mark Gordon said there were still opportunities in specific sectors. Noting that junior explorers had been responsible for "about 60 percent of non-bulk discoveries in Australia" over the past 20 years, Gordon said current challenges included tough market conditions, bureaucratic hurdles and community activism. "Most commodities are now trading relatively flat, although we have had a structural rise in prices since the beginning of the cycle [in 2003]," he said. "The increase in supply generated during the boom should be able to largely handle expected demand increases for major commodities for the next few years … however there is the potential for some minor and strategic commodities to experience significant demand increases or supply contractions. "The next market run will be largely due to consistent recoveries in the U.S. and European economies, sustained growth demonstrated by China and a pick-up in growth in other underdeveloped economies, such as India and Brazil." Gordon predicted "depressed gold prices" at around $1,200 to $1,400 an ounce "for a few years," while he saw a mixed outlook for bulk commodities. However, he pointed to opportunities in strategic and specialty metals due to users' need for diversified supply sources. CRU Consulting's Allan Trench was more bullish, however, noting that by 2023 there would be an extra $600 billion of commodities production value from China. "Ten years ago, the whole sector was only worth $150 billion globally," he said. "The individual dynamics of certain markets are having effects…[but] looking forward it's still the case that base metals will outperform bulk commodities," he said, forecasting further gains in aluminium, copper and zinc through to 2017. Trench reaffirmed his view that while China would continue to grow, the "next China" would be "western and central China." "Western and central China is starting to punch above its weight and grow market share in terms of total output…Over time, China's eastern seaboard will get closer to the OECD level [of urbanization], while central and western China will get closer to eastern China," he predicted. Trench said China's growing nuclear industry "may do for uranium what it has done for iron ore," predicting a long run uranium price of $75 a pound, more than double the current level. He also said "coal-fired power is not going to go away any time soon so the future of thermal coal is still bright," despite predicting China would cut coal-fired power's share of total power generation from 76 percent in 2012 to 64 percent by 2030. He was also bullish on zinc, predicting a price of $4,000 a ton by 2017 on strong demand and falling supply. However, he said CRU forecast a "gradually falling" iron ore price to around $85 to $90 a ton in real terms, with the exit of higher-cost producers unlikely to spark an immediate rally. Looking ahead, Trench said the "hot" commodities with a more than 15 percent average price increase by 2018 included aluminium, coking coal, nickel, tin and zinc, with lead and copper expected to see lesser gains. CRU expects prices of iron ore and oil to "cool" while the gold price contracts another 5 to 15 percent, with the worst outlook for silver, down by more than 15 percent. However, with the Australian dollar expected to depreciate by around 15 percent versus the U.S. dollar, Trench said local miners in the right commodities could expect profit gains. With plenty of clouds on the horizon, Asia's miners will be hoping policymakers from Beijing to Brussels apply more stimulus measures should the promised upturn fail to arrive. ULAANBAATAR, MONGOLIA, November 10 - The Asian Development Bank (ADB) and Japan are helping Mongolia establish more transparent and efficient public investment and taxation, through a $1.1 million technical assistance (TA) grant signed today. The grant, financed by the Japan Fund for Poverty Reduction and administered by ADB, will improve Mongolia's public investment management and monitoring and its e-taxation system. Mongolia's economy and budget have grown rapidly in recent years, but meeting the nation's pressing development needs remains a vast undertaking, so public monies must be well managed, prioritized and effectively applied to ensure maximum benefit for citizens. The grant agreement was signed by State Secretary of the Ministry of Finance Kh. Gantsogt, Director General Tunrev Batmagnai of the Mongolia General Department of Taxation (GDT), and Director General for East Asia Ayumi Konishi signing for ADB, with the attendance of the Embassy of Japan. "Mongolia has made improving transparency and efficiency in its public financial management a priority, especially with the President's 'Glass Account' initiative," said Mr. Konishi. "Modern public investment management and e-taxation systems will make the government more accountable, build trust among citizens, and ensure public financial management is more effective by enabling better budgeting for limited public resources." Mongolia initiated a public investment management system in 2011 to make information and data publicly available and better manage public investments. However, the lack of expertise available has hampered progress and the system remains in its formative stage. Since the early 2000s, GDT has been shifting to an electronic tax information system to automate registration of taxpayers and tax types, tax accounting, payment, and refunds. GDT has also been working to establish linkages with other government agencies. Elements such as business processes, database management, application software, and technical infrastructure are needed to establish a fully functional system. The TA will help establish the functions of both systems, while carrying out training for officials in the proper operation and maintenance, and conducting public awareness campaigns. ADB, based in Manila, is dedicated to reducing poverty in Asia and the Pacific through inclusive economic growth, environmentally sustainable growth, and regional integration. Established in 1966, it is owned by 67 members—48 from the region. In 2013, ADB assistance totaled $21.0 billion, including cofinancing of $6.6 billion. November 11 (infomongolia.com) The Hunnu Air, Mongolian domestic airline temporarily cancelled for uncertain period its international flights to Hong Kong from November 07, 2014. The reason to stop flights to Hong Kong is said due to financial difficulties and the Hunnu Air's two Airbus A319-100, the only fleets that conduct Medium and Short-Haul flights are being kept in Hong Kong and not authorized to departure until the Hunnu covers its debt to an affiliated company in Hong Kong. At this moment, all tickets purchased to/from Hong Kong-UB are being returned at "Air Trans" Ticket Agency. Currently, the Hunnu Air conducts its scheduled international flights to/from Erlian (Inner Mongolia), Manzhouli (Inner Mongolia) and Hailar (Inner Mongolia) as well as domestic flights to/from Uliastai (Zavkhan), Dalanzadgad (Umnugovi), Khovd (Khovd), Murun (Khuvsgul), Choibalsan (Dornod) and Ulaangom (Uvs). In May 2014, Mongolian domestic airline, Eznis Airways LLC announced to stop its operation for an uncertain period of time due to the financial difficulties. November 11 (infomongolia.com) One the largest and best known musical instruments manufacturing companies in the world, the Kawai has opened its doors in Mongolia and the launching ceremony with participants of well known musicians, politicians and other attendees was held at the Blue Sky Tower in Ulaanbaatar on November 07, 2014. At the blue ribbon cutting ceremony, Kawai Company President Hirotaka Kawai, Minister of Culture, Sports and Tourism Ts.Oyungerel, Ambassador Extraordinary and Plenipotentiary of Japan to Mongolia Takenori Shimizu, Governor of the Capital City and Mayor of Ulaanbaatar E.Bat-Uul and many other familiarities were present. Most notably at the launching ceremony, famous Russian pianist Elmar Gasanov and well known Japanese pianist Nanako Kurita have performed their best pieces introducing the Kawai piano's unique sounds upon the invitation. "By opening this brand shop in Mongolia, it creates a new atmosphere on music market and brings large-scale investment into social aesthetic education", comments Culture Minister Ts.Oyungerel. Also, the company authorities added to open Kawai Musical School in Ulaanbaatar. On the same day, Mayor E.Bat-Uul received in his office the Company President Mr. Hirotaka Kawai and in the scope of "Friendly Ulaanbaatar" Program, parties agreed to collaborate by organizing Piano Festival in Mongolia. Kawai Musical Instruments Manufacturing Co., Ltd., best known for its grand pianos, upright pianos, electronic keyboards and electronic synthesizers, headquartered in Hamamatsu, Shizuoka, Japan was established in August 1927 by Koichi Kawai. Mr. Hirotaka Kawai was appointed as President of the Company in 1989. He established Kawai manufacturing facilities around the globe. Today, the Kawai Musical Instrument Manufacturing Company distributes acoustic and digital pianos to over 80 countries. In Ulaanbaatar, the Kawai Shop is opened in the Blue Sky Tower. Promotional video for city's tourism by the Tourism Department of Ulaanbaatar. 10 November (Business Standard) The Cabinet secretariat has called a meeting this week of key ministries to review all memoranda of understanding (MoUs) signed with foreign governments which are over five years old but have registered little progress. The aim is to decide if these should be kept alive. Attending will be top officials from the ministries and departments of defense, justice, electronics and information technology, posts, telecommunications, legal affairs and overseas Indian affairs. The secretary (coordination) in the secretariat will preside. Those attending have been told to ensure their department is represented by at least someone of the rank of joint secretary, with knowledge on the matter. Departments have to prepare a detailed note on the total number of MoUs under their purview, which are over five years old, how many are inactive, new ones in the pipeline and their suggestions. Based on data from the ministry of external affairs, the Government of India signed 82 MoUs between 2005 and 2009. The countries include Mongolia, France, Germany, the US, Spain, Australia, UAE, South Korea and Britain. Another 130-odd MoUs were signed between 2010 till now. All MoUs need to be made into more concrete agreements. China dominates with around 20 MoUs signed in the five years till 2009, plus another 12 since then. The subjects for the older MoUs are varied - traditional medicine, housing, land resource management, scientific cooperation. In 2005, for instance, the two governments signed MoUs on aviation, sharing hydrological information on rivers, building a temple in China and to have a financial dialogue. A substantial number of MoUs were signed with Mongolia (four), Germany(five), US (four), Spain(five) Russia (four) and UAE (three) in the period between 2005 and 2009. KUWAIT, Nov 11 (KUNA) -- Kuwait's Ambassador to Mongolia Khaled Al-Fadhli discussed with the governor of Mongolia's Darkhan-Uul province bilateral relations on Tuesday amid a visit to the country. Discussions focused on several issues of mutual importance between the two countries, primarily investment opportunities on infrastructure in the province. The Kuwaiti government, through funding from the Kuwait Fund for Arab Economic Development, is currently involved in four infrastructure projects in Mongolia, and the local official praised the level of bilateral ties. November 11 (infomongolia.com) On November 10, 2014, Ambassador Extraordinary and Plenipotentiary of Mongolia to the Federative Republic of Brazil, Mrs. Chuluunbat SOSORMAA has presented a Letter of Credence to the President of Brazil, Her Excellency Dilma Rousseff. The credential handing ceremony was held along with other 32 Ambassadors to represent their states and during the credential handing, newly accredited Ambassador Ch.Sosormaa conveyed greetings of the President of Mongolia and noted that in order to open gateway to Latin America, Mongolia opened its Embassy in Brasilia in June 2014. Also, Ambassador of Mongolia congratulated Her Excellency Dilma Rousseff on being elected as the Head of State for her second term. In response, President D.Rousseff pledged to pay particular attention in stimulating Mongolia-Brazil bilateral relations and will be pleased to welcome top and high-level visits from Mongolia. Mongolia and the Federative Republic of Brazil have established the diplomatic relations on June 19, 1987. Havana, Nov 11 (IANS): Cuba and Mongolia have signed a five-year Agreement of Sports Cooperation to boost the bilateral ties on sports management and administration. The accord was signed by Mongolia Ambassador Otgonbayar Davaasambuu and Antonio Becali, president of Cuban National Sports Institute (Inder) Monday, reports Xinhua. The agreement covers a wide range of areas, such as sports infrastructure, information and sports documentation and anti-doping collaboration. Becalli stressed that the signing of the agreement "revitalised" the history of the sport collaboration between both countries, and recalled the participation of Cuban boxers at the classic Tournament Ulan Bator. The Mongolian ambassador, on the other hand, expressed his gratefulness for the signing of this agreement, "which will contribute to further deepening the sports links between Cuba and Mongolia". Our Blue Waves Campaign was launched by the Lake Hovsgol Conservancy and the Mongol Ecology Center on October 31, 2013. It is part of a larger effort to celebrate and raise awareness of the global significance of Lake Hovsgol National Park. Our goal is simple: to rally an audience that is worldwide, and then support, fully equip, and train the park rangers who are working to preserve this magnificent ecosystem. Why Lake Hovsgol and its Ecosystem? Nomadic tribes were first attracted to the beauty of Blue Pearl some 4000 years ago. Visitors today still come across many cultural artifacts that remain strewn around the park. Mongolians also call Lake Hovsgol, the Mother Sea, for it contains 70% of Mongolia's (and 1% of the Earth's) freshwater. Surrounded by forests, the water entering the lake can take 500 years to exit via the one outlet: the Eg River. Recognizing the cultural and ecological value of the region, in 1992 the Mongolian government formed Lake Hovsgol National Park. This Park encircles the lake and covers 1.2 million hectares (or 2.5 million acres) – making it bigger than Yellowstone National Park in the US. What is Rally for Rangers? One of the key events in our Blue Waves campaign is Rally for Rangers. This Rally helps us raise funds to purchase new motorbikes and gear for rangers— which they then use to patrol National Parks of Mongolia. In 2014, we were able to present an array of new motorcycles for Lake Hovsgol National Park. A team of 15 intrepid riders from around the globe—from America, Germany, Australia, New Zealand, and Mongolia—participated in this cross-country trek. They rode 1500 miles through the Mongolian highlands, ultimately delivering the motorcycles to park rangers. In 2015, our campaign team is raising funds to equip 20 more park rangers in Tengis Shishged, Ulaan Taiga and Horidol Saridag National Parks—all key protected areas adjacent to Lake Hovsgol and larger part of the ecosystem. November 11 (New Historian) The Altai Mountains, lying on the border of Russia, Mongolia, China and Kazakhstan, are home to thousands of petroglyphs that fascinate archaeologists and tourists alike. Now, a team of archaeologists has begun to uncover even more extraordinary art in the region. The experts found a mind-boggling alfresco exhibit in a rarely-visited section of the Saldyar Valley, close to the Katun River and Russia's border with Mongolia. The newly discovered rock artwork is thought to date back about 5,000 years. Complete excavation cannot take place yet, as the area is currently covered in snow. The archaeologists will return next year when the snow has melted. The Altai Mountains display the handiwork of the fine artists of prehistory. The thousands of petroglyphs and drawings in the area have been studied and perused for more than a century. Not everywhere in the Altai Mountains have these carvings but many have been found, even though the jagged terrain is extremely difficult to traverse. What makes these newly unearthed carvings so interesting is that they've been drawn in a way that allows the sunlight to illuminate them, giving off light similar to that of a photo negative. One of the animals most commonly drawn was the Siberian mountain goat, which was a symbol for success and supposed to bring good luck when hunting prey. Professor Andrey Borodovsky, from the Institute of Archaeology and Ethnography at the Russian Academy of Sciences in Siberia, said there are several thousand petroglyphs in the Saldyar Valley alone. He went on to say that the area is very rarely visited by archaeologists and other researchers, because it is so far from civilization. As a result of the infrequent expeditions, many more treasures like the recent find could still be waiting to be discovered. Apart from the mountain goat, another popular depiction found in the petroglyphs was that of the long-horned bull. The bull has historically represented strength and power in cultures around the world, including Central Asia, Mycenaean Greece and Ancient Egypt. Other petroglyphs showed hunters, bows and arrows in hand, standing beside slain beasts. The strangest petroglyph the archaeologists unearthed was of a deer with large, disproportionate horns and a snout that resembled a bird's beak. Similar petroglyphs to this one have been found as far away as Mongolia and Trans-Baikal, revealing just how far the ideas of ancient people travelled. It is still a mystery as to why these petroglyphs were created, and archaeologists are trying to find clues to answer this burning question. Some theories state that the carvings were dedicated to the gods or spirits, so that they would make farmer's cattle meatier. Others believe that the carvings showed where the best hunting trails were. There is a strong possibility that the true answer to this will never be discovered, but these works of art show just how creative ancient civilisations could be. 10 November (Inside the Games) A Mongolian delegation that will compete in eight sports is preparing to depart for Phuket for the Asian Beach Games, which are due to open on Friday (November 14). Despite being a landlocked country, the central Asian nation has a strong heritage in beach sport, having participated in all three previous editions of the Asian Beach Games, winning their only gold, in beach wrestling, at the first event in Bali in 2008. Combat sports will provide the greatest number of medal opportunities this time once again, with teams participating in Sambo, Kurash, Jiu-Jitsu and Muay Thai, as well as beach wrestling. Athletes will also compete in petanque, beach modern pentathlon and basketball 3x3. The team were sent on their way with a farewell ceremony organized by the Mongolian National Olympic Committee. MNOC President Demchigjav Zagdsuren was among those present, along with J.Khatanbaatar, the team's Chef de Mission at Phuket 2014. The Games are due last until November 22, with 6,000 athletes representing 45 countries set to compete in 26 beach or sea sports. November 11 (The Asahi Shimbun) Yokozuna strongmen Hakuho and Harumafuji were put to the test on Nov. 11 at the Kyushu Grand Sumo Tournament and only Hakuho emerged victorious, while the junior member of the grand champion trio, Kakuryu, also emerged unscathed. Ozeki Kisenosato and Mongolian rising star Ichinojo also won their bouts. The 29-year-old Hakuho fought his way back from what seemed like certain defeat after top maegashira Tochiozan blitzed him all the way back to the edge and unleashed a final body push to close the deal at Fukuoka Kokusai Center. But Hakuho managed to get both of his arms in position to leverage Tochiozan's center of gravity upward and then flipped him to the dirt with a fast and perfectly executed throw. Though he started off weak, Hakuho's determination to win this competition was obvious in his deft turning of the tables--he is after not only his 32nd career title but also a place in sumo history for winning more tournaments that any other man, trailing only current record holder Taiho by one. In sharp contrast, Harumafuji, still recovering from an eye-socket injury, chased maegashira No. 3 Takayasu around the ring, moved in too low and launched an attack while out of position, stepping over the edge in the process. It was Takayasu's third win over a yokozuna. "I won't let it go to my head," said Takayasu, who improved to 3-0. "I'll keep my focus on tomorrow's match." Kakuryu, still unbeaten, used a throat thrust and some good pushing maneuvers to keep top maegashira Aminishiki off balance. Kakuryu also seemed to be losing his focus at the end, but bumped the veteran Aminishiki (0-3) with his shoulder and that was just enough to force him out. Also unbeaten, ozeki Kisenosato had another easy match, staying on the offense all the way and driving out komusubi Takekaze (1-2) with a series of thrusts. Kisenosato is already the only unscathed ozeki. Kotoshogiku fell flat in mid-attack for his first defeat, against maegashira No. 2 Takarafuji (2-1). And though three proved to be a charm for Goeido, who defeated komusubi Ikioi (0-3), it was his first win of the tournament. Goeido is fighting at ozeki for only the second time this tourney and seems to have a lot of kinks to work out. Sekiwake rivals Aoiyama and Ichinojo squared off for a solid bout that saw Aoiyama (1-2) come on strong and Ichinojo take him down with a persistent left-handed hold followed up with a well-timed downward push on the Bulgarian's neck. Despite his loss on the opening day to Harumafuji and a mediocre (but successful) showing on Nov. 10, Ichinojo is testing out the deep waters this tournament after his speedy rise following September's 13-2 finish and is starting to look quite suited to the top echelons. He certainly had Aoiyama's number. As he adds on more confidence and experience, Ichinojo will undoubtedly grow stronger and stronger--if injuries don't block his upward trajectory. Ulaanbaatar, November 11 (MONTSAME) The suggestion on conservation of bird species named "Great Bustard" has been approved at the eleventh meeting of the Conference of the parties to the Convention on the Conservation of Migratory Species of Wild Animals (CMS). The meeting ran on November 3-9 in Quito of Ecuador. Mongolia was represented by a head of Department for Foreign Cooperation of the Ministry of Environment and Green Development D.Batbold. The proposal was approved along with other 31 from several countries on improving conservations of sharks, birds and gazelles. "Great Bustard" was moved to the Appendix I of the CMS from its Appendix II. "Great bustard" has been reported a population of 2,000 left in Russia, Mongolia and China, and some 300 in Central Asia. The reproduction of the species are very slow in process as it takes approximately ten years for a female bird to be able to give offspring. The Secretariat of the Convention agreed, for the first round of activities, to collect funding for organizing an international conference on conservation of "Great bustard". The meeting also included Mongolia in the Standing Committee on implementing the convention and appointed Mongolia the deputy chairman of the Committee for a three-year term. The Deputy Chairman is obligated to participate in annual meetings, to take part in settlement of the issues occurred outside of the meetings, and to chair meetings of the Committee in the absence of a chairman. Mongolia will also serve as the Asian representative to the Financial Committee of the Convention. The migratory species of wild animals have higher risks to lose their migrating territories due to hunting and to have food deficits during their ecological migrating periods. Thus the Convention on Conservation of Migratory Species of Wild Animals was enacted in 1979. Mongolia joined the Convention in 1999, the parties to which must observe duties to protect the avian and aquatic animals and vertebrates that migrate through their territories. The Convention on CMS is ratified by 120 countries so far.